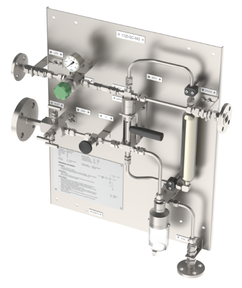 The Fixed Volume Closed Loop Liquid Sampler is designed to provide a fixed volume sample independent of process pressure or flow rates, while keeping the operator isolated from the process stream and line pressure. Fixed volume liquid sampling provides your company with the means to acquire representative, safe and emission-free samples. The easy-to-use systems, manufactured by Mechatest, allow for safe operating, protecting the operator against hazardous, volatile emissions. 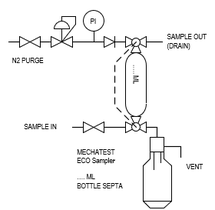 Keep it simple, keep it safe, use equipment engineered and built by Mechatest for fixed volume liquid sampling. This simplified, one-valve design allows for volume accuracy while obtaining a representative, emission-free sample safely. A pre-measured volume of sample is isolated and moved to a sample vial with a carrier gas. This system is a true dead volume sampler, as it and the sample vial are fully purged during the sample cycle, providing an inert atmosphere prior to each sample. The panel mounting allows for easy pipe, wall, or flange mounting. The Fixed Volume Closed Loop Liquid Sampler can be designed to work automatically as a multi-vial sampler or as a composite sampler. Companies active in (petro)chemical industries acknowledge the importance of collecting representative samples. Proper fixed volume liquid sampling is necessary to ensure product verification and the quality of end products. Fixed volume liquid sampling prevents spillage and is ‘failure proof’ at the sample tap. The sampling systems by Mechatest prevent any contamination and allow for a sample that represents the entire batch because the sampling is independent from the other process conditions. Due to its fixed volume, this form of liquid sampling also allows for better comparison between different samples of the same batch.